Exocytosis is the process by which a cell packages materials in membrane-bound secretory vesicles inside the cell and directs these secretory vesicles to fuse with the cell membrane (plasma membrane), releasing the packaged materials to the exterior space. These membrane-bound vesicles may contain macromolecules (such as soluble proteins) to be secreted to the extracellular environment, as well as membrane proteins and lipids that are sent to become components of the cell membrane. The function of exocytosis is the opposite of endocytosis in which cells ingest material from outside the cell by enclosing it with a portion of their cell membrane and bringing it into the cell in a membrane-bound vesicle. Exocytosis is a fundamental process for a cell to maintain homeostasis and to fulfill its functions. On the one hand, a cell needs to move intracellular materials to the plasma membrane for the individual function of the cell's own well being, such as providing proteins to strengthen the cell coat or for maintenance of the plasma membrane, and in order to remove toxins and waste materials. On the other hand, the cell produces materials for the larger function of providing benefit to extracellular components of the multi-cellular organism, such as nutrients for other cells or signaling molecules for neuronal activity. All of these materials are moved by the process of exocytosis from the inside of the cell to the cell membrane, where they fuse and then are able to be transported outside. For example, a digestive enzyme needs to be moved from inside a cell to the exterior to provide its function of degrading food particles. Likewise, the hormone insulin is placed into secretory vesicles in a cell and moved to the outside where it can enter the bloodstream and provide its function for other cells, causing them to take up glucose from the blood. 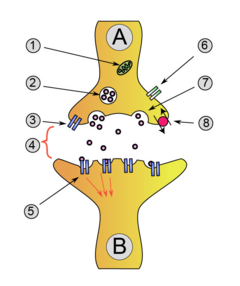 Illustration of an axon releasing dopamine. While small polar molecules can pass out of the cell through the plasma membrane, macromolecules, such as proteins, cannot directly pass through the plasma membrane because of their size or hydrophilic nature. Exocytosis is a means, involving vesicular transport, for macromolecules produced by the cell to move to where to where they are needed outside of the cell. Exocytosis is a fusion process, involving the sequential formation of membrane-bounded vesicles with the cellular product and then fusion of this membrane-bound vesicle with the cell membrane. The fusion of the originally separate regions of lipid bilayer involves at least two basic steps, bilayer adherence, whereby the two bilayers come into close apposition, and bilayer joining, whereby they fuse (Alberts et al. 1989). For example, for insulin to be secreted across the plasma membrane, the insulin molecules, after created, are packaged in specialized membrane-bounded secretory vesicles. In response to signals coming from outside the cell, the secretory vesicles move to the plasma membrane, fuse (adhere and join), and then open to the space outside the cell, releasing the insulin to the exterior where it is needed (Alberts et al. 1989). Inside the cell, the macromolecules in the vesicles are kept from mixing with the organelles and other macromolecules in the cytoplasm. They only fuse with a specific membrane, leading to a directed transfer. The process of exocytosis may move macormolecules for various purposes. The secretory vesicles may carry new components for the plasma membrane from the Golgi apparatus to the plasma membrane, where they will stay in the plasma membrane. They also may carry molecules designed to be excreted from the cell but to adhere to the cell surface and become part of the cell coat. Some excreted macromolecules may be incorporated into the extracellular matrix. And some secretory vesicles may carry macromolecules to be excreted from the cell to diffuse into the blood or interstitial fluid to signal or nourish other cells or for removal of waste products and toxins (Alberts et al. 1989). Exocytyosis (ek-soh-sy-TOH-sis) comes from the Greek Έξω, meaning "external," and κύτος, meaning "cell." In multi-cellular organisms, there are two types of exocytosis: 1) Ca2+ triggered non-constitutive (regulated) and 2) non Ca2+ triggered constitutive. Constitutive pathway of secretion. This pathway involves proteins that are continually secreted by the cells in which they are made, being carried promptly to the plasma membrane after being packaged into the membrane-bound transport vesicles (Alberts et al. 1989). Constitutive exocytosis is performed by all cells and serves the release of components of the extracellular matrix, or just delivery of newly-synthesized membrane proteins that are incorporated in the plasma membrane after the fusion of the transport vesicle. Regulated pathway of secretion. This pathway involves proteins and/or small molecules that are stored in vesicles and only fuse with the plasma membrane after an extracellular signal triggers the cell. Unlike the constitutive pathway, the regulated pathway is found primarily in cells that are specialized for secreting their products (hormones, neurotransmitters, digestive enzymes) rapidly on demand. In these secretory cells, the extracellular signal is often a chemical messenger (such as a hormone), and the activation of receptors generates various intracellular signals, including a transient increase in the amount of free Ca2+ in the cytosol. These signals initiate exocytosis, leading to fusion of secretory vesicles with the plasma membrane and release of the products to the extracellular space (Alberts et al. 1989). Exocytosis in neuronal chemical synapses is Ca2+ triggered and serves interneuronal signaling. Certain vesicle-trafficking steps require the translocation of a vesicle over a significant distance. For example, vesicles that carry proteins from the Golgi apparatus to the cell surface are likely to use motor proteins and a cytoskeletal track to get close to their target before tethering would be appropriate. Both the actin- and the microtubule-based cytoskeleton's are implicated in these processes, along with several motor proteins. Once the vesicles reach their targets, they come into contact with tethering factors that can restrain them. It is useful to distinguish between the initial, loose tethering of vesicles with their targets from the more stable, packing interactions. Tethering involves links over distances of more than about half the diameter of a vesicle from a given membrane surface (>25 nm). Tethering interactions are likely to be involved in concentrating synaptic vesicles at the synapse. The term docking refers to the holding of two membranes within a bilayer's distance of one another (<5-10 nm). Stable docking probably represents several distinct, molecular states: The molecular interactions underlying the close and tight association of a vesicle with its target may include the molecular rearrangements needed to trigger bilayer fusion. A common feature of many proteins that function in vesicle tethering and docking is their propensity to form highly extended, coiled-coil structures. Tethering and docking of a transport vesicle at the target membrane precedes the formation of a tight core SNARE complex. 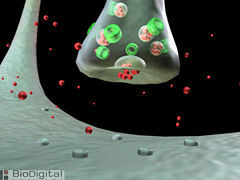 In neuronal exocytosis, the term priming has been used to include all of the molecular rearrangements and ATP-dependent protein and lipid modifications that take place after initial docking of a synaptic vesicle but before exocytosis, such that the influx of calcium ions is all that is needed to trigger nearly instantaneous neurotransmitter release. In other cell types, whose secretion is constitutive (that is, continuous, calcium ion independent, non-triggered) there is no priming. The vesicle fusion is driven by SNARE proteins and is the process of merging the vesicle membrane with the target one resulting in release of large biomolecules in the extracellular space (or in case of neurons in the synaptic cleft). The surface of the plasma membrane increases (by the surface of the fused vesicle). This is important for the regulation of cell size, such as during cell growth. Proteins embedded in the vesicle membrane are now part of the plasma membrane. The side of the protein that was facing the inside of the vesicle now faces the outside of the cell. This mechanism is important for the regulation of transmembrane receptors and transporters. Monck, J. R., A. F. Oberhauser, and J. M. Fernandez. 1995. The exocytotic fusion pore interface: A model of the site of neurotransmitter release. Molecular Membrane Biology 12(1): 151-156. Retrieved December 21, 2008. This page was last modified on 22 December 2008, at 16:35.